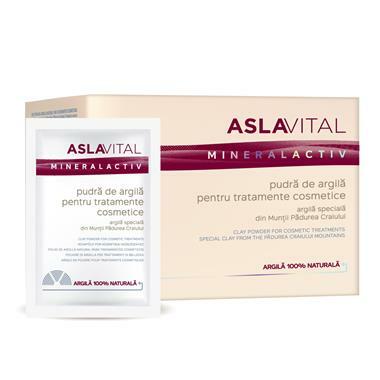 Aslavital natural clay offers important minerals, drawing abilities, and detoxification properties for skin health. It can be successfully used in cosmetic formulas for all skin types, including sensitive, irritated, allergic, oily, wrinkled, prone to acne or couperose. Farmec uses the clay from Pădurea Craiului Mountains, proved to have remineralizing, cicatrizing and soothing action, with a remarkable anti-toxic and absorbing power that constitutes a natural filter against UV radiations. This clay source had been carefully selected: it has a well-defined chemical and mineralogical composition, with predominantly argillaceous fractions, and it is not chemically treated. It is rich in Aluminosilicates and contains over 20 natural minerals: Iron, Potassium, Magnesium, Manganese, Copper, Calcium, Zinc, Selenium etc. Natural Clay - A non-chemical treated, sourced from Pădurea Craiului Mountains, with remarkable remineralizing and toxin absorbing powers. Restores skin’s radioactive balance and enhances its natural filter against UV radiations. Aslavital clay is a powerful agent for physical regeneration which fuels body cells with vital energy, reviving them. Usage: To make cosmetic masks, mix the clay powder with hydrosols, Aloe Vera gel, herbal infusions, different fruit and vegetable juices, dairy products, honey, olive oil, yolk etc, depending on the skin type. The resulting mask should have a spreadable, easy-to-apply texture. Apply the mask on the clean face and leave it to act for 20-30 minutes, or until starts to dry. To remove the mask, wash your face with warm water and a washcloth. For oily skin combine the clay with natural juices with astringent effect, such as: tomatoes, lemon, cucumbers, apricots, peaches. For normal and dry complexions use ingredients with moisturizing and nourishing proprieties: cucumbers, celery, milk, honey, olive oil, yolk. For the acne treatments prepare a mixture of clay powder and tap water, water maintained on wheat bran, sea water, spring water. It is so handy that I often bring a pack or two when I go overseas on business. Using only one is enough to apply to face and neck. Not to mention, I am very satisfied with the result after using this.